The mission is to provide a setting and programs for the purpose of leadership training, environmental education and recreation for youth and families to develop responsible citizens. 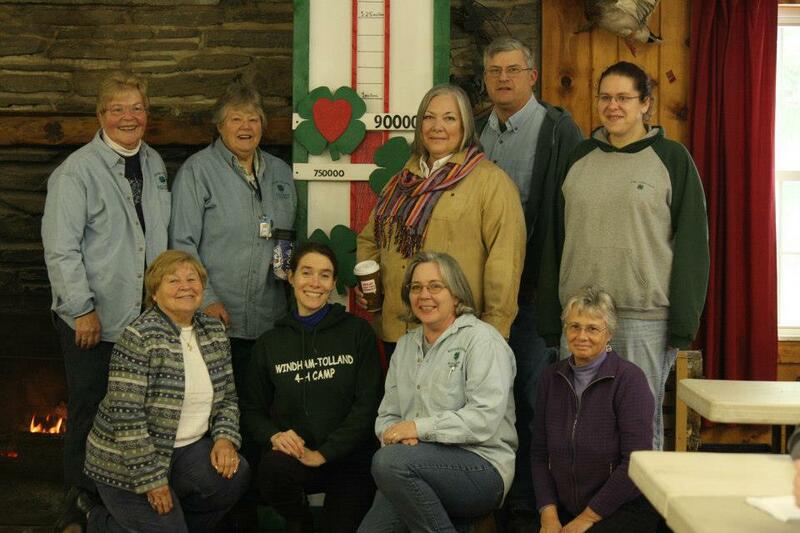 The Windham County 4-H Foundation, Inc. is a nonprofit 501 C3 organization that was established in 1953. The Foundation is the legal entity that owns the Windham County Outdoor Center and operates the summer camp and Ragged Hill Woods environmental programs on the property. The Foundation Board meets monthly and holds an annual meeting in January. Foundation volunteers manage the maintenance of the facility, employing only a few year round employs as Youth Program Director, Caretaker, Camp Registrar, and bookkeeper. Seasonal staff is hired to work with our summer camp program. All members and employees undergo background checks to help ensure everyone’s safety. In the spring of 1953, mail carrier Freeman Nelson noticed a lovely spot in the woods with a cabin and a pond on Taft Pond Rd along his route. He went to a meeting that night and told some of the folks who were looking for a 4-H camp about what he had seen. When they contacted the owner, Ed Jezerski, he already had plans for the property, but having been involved in 4-H club work before, the idea of a 4-H camp appealed to him. He offered to sell the six acre pond, fifteen surrounding acres and a waterfront cabin that had once belonged to Congressman Horace Seely-Brown of Pomfret for $15,000. A $500 down payment was made in October of 1953, with the remaining amount due in April 1954. Each of the 15 towns in the county went to work to raise the money. With the support of local businesses, granges, the Lions Club and 4-H clubs, in 90 days volunteers had construction a 40’ x 60’ lodge, a director’s cabin, an infirmary, 11 cabins and a nurse’s office. A local fire company “blew” truckloads of dumped sand into the waterfront areas creating a beach and swimming area. The night before camp opened fifty people were in the lodge making benches, tables, and finishing the kitchen. 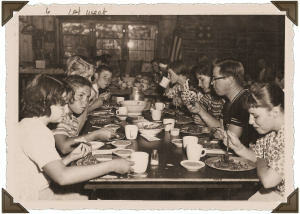 On the morning of July 1, 1954, crews were still sweeping sawdust out the back door as campers arrived, but camp was ready and it has remained open for campers every summer since then. Since 1954 the Foundation has purchased 229 additional acres and the property now includes three ponds, a two barn horse camp area, a nature lodge and a total of 43 buildings. A major renovation and expansion of the lodge was completed in 2015. The camp is in use year round by the Ragged Hill Woods Environmental program and as a rental facility for weddings, business seminars, and local groups who take advantage of its peaceful setting and acres of land with walking trails and a nature center. A large stone fireplace dominates one wall of the main lodge. 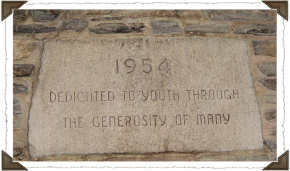 Etched in stone above the mantel is the inscription, “Dedicated to Youth through the Generosity of Many.” Going back to 1954, dedication and generosity continue to be the driving forces that have brought our camp to where it is now.